QSRs cannot take loyalty for granted as it often extends only as far as the next incentive or reward. That advice comes from Attracting New Customers and Creating Greater Loyalty is What’s on the Menu for Quick Serve Restaurants, a study from The Media Division of Publishers Clearing House. 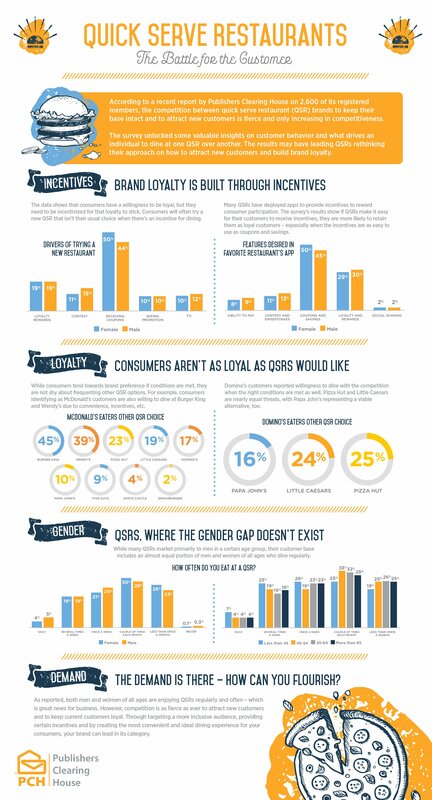 The organization surveyed more than 2,600 registered members of its online community on the ways customer behavior is heavily influenced based by how QSRs implement incentive-based programs to reward them for their patronage. For QSRs, the ability to attract and retain customers has become as much about providing the right level and type of incentive as it is delivering a quality product. Programs such as restaurant apps have become essential tools in keeping customers coming through the door as they provide the vehicle to deliver continuous promotions and cost savings – an approach favored by more than half of all respondents. As hard as QSRs are trying to build customer loyalty and boost retention, the competition is trying just as hard to lure them away. Data from the report highlighted that receiving a coupon would be incentive enough to try a new QSR for nearly half of all respondents. Another 20 percent would be willing to choose a competitor if they offered a rewards program. Data shows customers are willing to try new brands when they receive a compelling offer and it’s a constant game of one-upmanship among QSRs to bring the most attractive incentives to market. For QSRs, the ability to attract and retain customers has become as much about providing the right level and type of incentive as it is delivering a quality product. To learn more check out the infographic below or click here for the report.